Marking its strong presence at the UITP MENA Transport Congress & Exhibition 2018, MAN Truck & Bus Middle East, together with its partner in the UAE, Darwish Bin Ahmed & Sons, is showcasing the company’s all-new MAN Lion’s Coach at the biggest gathering in the region’s public transport industry, which is taking place in Dubai from 23rd to 25th April, 2018. The company has announced that the latest addition to the company impressive line-up of luxury, long-distance buses, the MAN Lion’s Coach, which premiered at Busworld 2017 in Belgium, is now available for orders in the UAE and across the Middle East. With its distinct safety, comfort and performance-driven features, the highly efficient, safe, economic and innovative coach has already gained the attraction of visitors to MAN Truck & Bus Middle East’s stand at the exhibition, which brings together industry leaders, policymakers, legislators, developers, consultants, operators and manufactures under one roof to discuss future solutions of public transport means. “We are pleased to participate in the UITP MENA Transport Congress & Exhibition 2018 and honoured to showcase our all-new MAN Lion’s Coach on a platform that explores future solutions of public transportation. With its fast-growing economies and ongoing public transport projects worth more than $100 billion, the Middle East and North Africa region presents an excellent opportunity for commercial vehicle manufactures, and, therefore, we attach great importance to this gathering of major players in the industry. 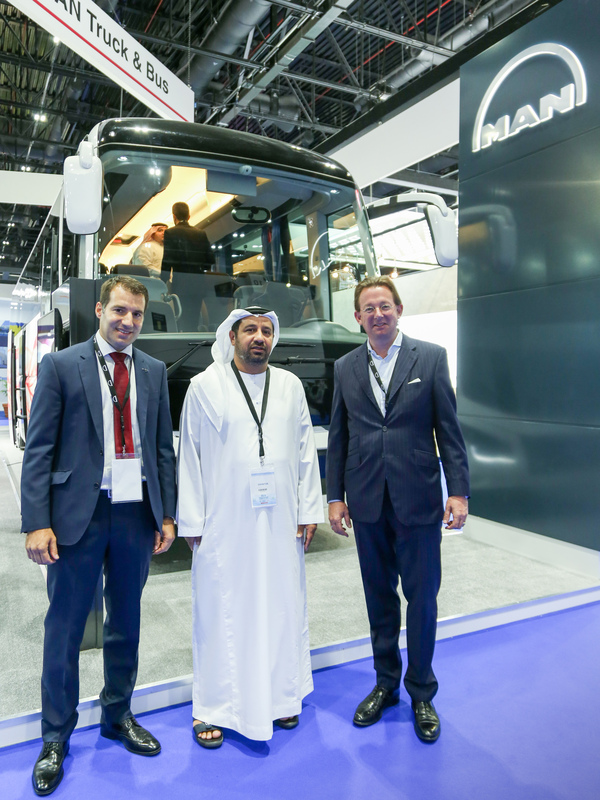 MAN Truck & Bus Middle East remains committed to transforming the region’s public transportation landscape by providing innovative mobility solutions,” said Franz von Redwitz, Managing Director MAN Truck & Bus Middle East. With its modern yet timeless design, the MAN Lion’s Coach marks the beginning of the new MAN bus design language at the front, rear and sides, and sets a new benchmark in luxury, attractiveness and efficiency. Further enhancing its appeal, the all-new coach features LED main headlights and taillights with strip-form brand-specific daytime running light which also functions as a turn indicator. With its ability to absorb 50% more impact energy in the event of a crash, the MAN Lion’s Coach has reinforced the leading German commercial vehicles manufacturer’s commitment to safety. The all-new MAN Lion’s coach also features an array of assistance systems such as Emergency Brake Assist (EBA), Adaptive Cruise Control (ACC) and Lane Guard System (LGS) accident prevention technology. To provide enhanced comfort and safety, the MAN Lion’s Coach is further equipped with new generation shock absorbers and optimized vehicle configuration. In addition to providing greater driving comfort and improved handling, the new features also contribute to further increase in fuel efficiency as well as a 20% improvement in aerodynamics.